Drip line is durable, economical and very easy to use. Our 1/4" drip line has 1/2 GPH emitters built right in. Available in varying emitter spacings to meet all your needs. This commercial grade, non pressure compensating poly drip line is made of the highest quality resins and is resistant to UV rays. 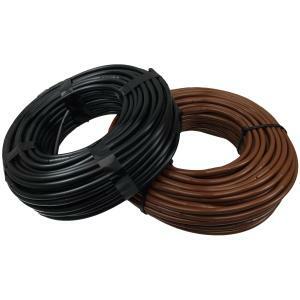 This tubing is great for using in your raised beds, window boxes, garden rows (under 30'), and densely planted landscape areas. Many use it for square foot gardening and making tree rings also. This drip line also works well with gravity and low-pressure drip systems as long as the water is clean and filtered, and a minimum of 5 PSI can be achieved. Punch a hole into mainline tubing using any of our 1/4" punches. Next, install a 1/4" barbed coupler into the section of drip line and insert into the hole that was punched in mainline. Then, plug the open end of the drip line with a goof plug.